FeedMeSports is better than any politician alive or dead. How? It actually delivers what it says it will! It is so simple, even I could use it. click on Add Team, find your league, find your team and voila…your team is added in seconds. 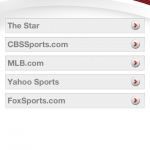 Under each team are a list of local, regional, national and internet news sources (even blogs). Simple simple simple! Then….